Ever since we started our canvas printing services over a decade ago, I have had people ask me if they can print a photo or other digital image then paint over it. Initially we only would get this question on occasion however now it seems we are asked about doing so all the time. The answer is a simple “yes” with many artists painting directly on their canvas print. I like to classify painting over canvas prints in two categories. One is using the image printed on canvas as an under painting while the other is the process of highlighting or adding embellishments. Perhaps we can include a third classification which I will touch on very briefly which would be somewhere between the two. I would probably define it as sort of a mixed media approach. The under painting method will be the most comprehensive area we will discuss since someone repaints the entire image with paints and is using the original photo printed on canvas for reference. Traditionally, an under painting is created with paint the artist blocks in as non detailed subject matter on the canvas. The purpose is to give the artist a sense of composition and help guide them when they start painting in greater detail. Afterwards they paint over the under painting in much greater detail. With the invention of actually printing on canvas, artists can now use photos as their under painting giving them a greater sense of accuracy. You would be surprised at how many professional artists use this method. One customer of ours who does historical art takes photos from festivals with re-enactments and composes them together with Adobe Photoshop. She then has them printed from which she creates an original work of art. Her paintings sell very quick, so ironically she turns around and has those “original” scanned or photographed right away so she can then order prints made later. Other artists we know use painting programs and create low detailed simulated painting from either photos or from scratch which they then paint over. The second way of painting over an image is usually referred to as highlighting or embellishing. The highlighting option is easier than painting over the entire image since it requires less skill and experience with paints. 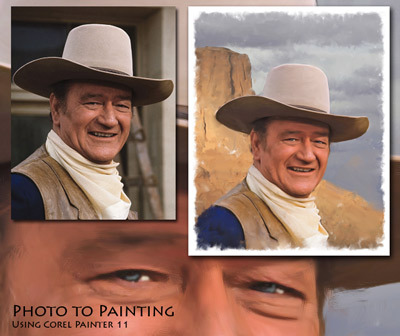 The image highlighting is the process of adding daubs of paint to various portions of the image for the added benefit of actual paint and brush stroke texture. To get the actual look of a painting and not just the look of daubs of paint I recommend people first apply an effect to the digital image which gives it a painted look. We will talk more about that in detail below. Many times professional artists use highlighting to give their reproductions greater value and look more like an original while preserving the look. The late Thomas Kinkade, otherwise known as the “Painter of Light” did this (or had people to do this for him) which enabled him to successfully sell his prints at very high prices. If you are a skilled painter but reluctant to bury your print entirely in paint right away, I would start with the highlighting option and gradually apply more paint as you become comfortable with it. Finally there is the mixed media approach. Usually when we think of mixed media as it is understood in the art community we think of a combination of various mediums (paints, pastels, inks, etc). Today that can also include digital prints produced via an inkjet printer. To touch briefly on this method, I consider this somewhere between highlighting the print with paint and painting entirely over the print. You might leave some areas untouched while painting over others. There is no set rule on this so deciding at where to stop painting on a print is entirely up to the artist and what they feel comfortable with. Before getting started you must decide what you are going to paint and how will you format it. I am assuming you will want to paint something like a landscape or portrait from a digital photograph so deciding what to do with that photo before painting on it is an important decision. In my case I like to apply an artistic painterly effect to the image first since I don’t plan to repaint the entire image but just enhance the look by giving it more of the feel of a painting. At the same time I want my viewer to think they are looking at an original work of art. There are three software programs offered by the people at Corel (http://corel.com. All of these programs let you click something like a “play button” and the software automatically starts to paint stroke by stroke. My favorite is Corel Painter. To me, Painter is sort of like and earlier version of Photoshop but geared toward artists. Photoshop users will find the interface similar. It’s a little pricy and retails for at least several hundred dollars since it is used by serious hobbyists and professional illustrators but in my opinion is the best choice since it has a huge array of painterly like brushes and brush settings. Below is a quick example of a photo using this technique. Fortunately there is a consumer level version which is a lot of fun called Corel Painter Essentials. Last I checked the auto painting option does just as good a job. It does not have as many brushes or brush effects but the software only runs about $60. Finally, and something relatively new is a program called Paint-it which retails about $40. I have not tried out the software more than once but from what I can tell it primarily does what you will need at the basic level. You will want to do a search online on Corel tutorials on how to use these programs to make a photo look like a painting. The good news is all these programs are offered as fully functional trial versions which you can download at the Corel website. I would test them out before buying and follow some of the video tutorials on the Corel web site. One last note on the first two programs: After running the auto-paint I like to further work on the image by hand. It’s possible to do it with just your mouse but to really make it look like it was done by hand use something like a Wacom stylus tablet (http://wacom.com) as pictured here. 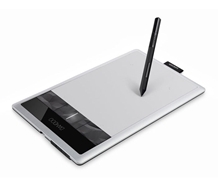 The stylus tablet plugs into your computer and has a special pressure sensitive pen so it is like really drawing or painting. Admittedly it takes a little getting used to but once you do your digital brush strokes look more organic and natural to the eye. 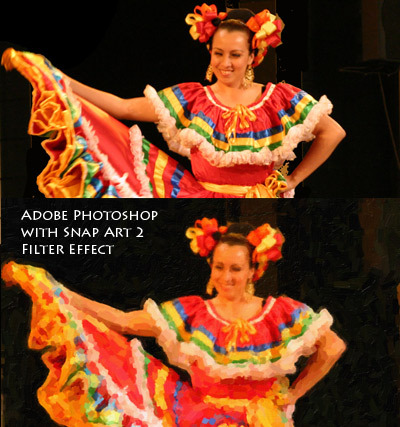 My next favorite is a program that can either be used alone or as a Photoshop plugin called Snap Art. It’s the easiest to use and with a few clicks you can get results almost as good as Corel Painter. Sometimes I like to use both Snap Art and Corel Painter when it looks like Corel Painter by itself keeps an image looking too much like a photograph. Lastly, programs like Adobe Photoshop or Photoshop Elements will work since they allow you to apply artistic filters to your image. I think the filters do a decent job, especially if you plan to apply a lot of paint over the image but other than that I think the filters have a bit to be desired. There are some people very skilled at Photoshop that use other techniques or use a combination of filters and Photoshop brushes but it requires some very advanced Photoshop skills. Once you have applied your painted look to your photo, you may be tempted to stop there. If so, that is fine but if you want to use actual paints to make both look and feel like a painting, the next step is to print it on canvas. That is where FinerWorks can come in. Most of our artists will order their canvas unmounted. I don’t think it has to be unmounted but I prefer it that way myself since I like to paint with it flat on a table. On the other hand if you do not have any canvas mounting skills or mounting tools then it is best to order the canvas stretched and mounted. Before applying the paints you might be wondering if you need to treat the print with any sort of special coating. If you are ordering your prints from FinerWorks you do not need worry about that since we coat the printed canvas with a clear coat finish for you. This protects the inks from smudges and scratches but most of all seals the inks so they will not react with the paint. If you are using another company for your canvas prints, you may have to experiment with different coatings to see if you run into issues such as inks or the primer on the canvas not working with the finish. I recall once where we were looking at switching to a different canvas produced and labeled by a well known ink jet printer company. Within seconds after applying a clear coat to protect the inks, we saw the printed image turn cloudy white due to the primer on the canvas reacting with the coating. When I researched this online I found out this brand of canvas had problems with most coatings. Obviously we chose not to go with that canvas but I have heard of similar stories by artists who ran into similar problems when they ordered canvas prints from companies that did not provide any coating. Next I am going to address is which is better, oils or acrylics. My answer is whichever you prefer. If you don’t have a lot of painting experience you might prefer acrylics simply for the ease of cleaning up afterwards. Just keep in mind acrylics dry much quicker than oils so if you are taking your time, you might need to wet the paints on your pallet every now and then. Some artists use a spray bottle with a little water to occasionally rewet their paints. Overall from conversation with artists who paint over their prints on a regular basis, I have not heard of any instance where there was a problem using either oils or acrylics. I also like to add a bit of a gel medium to the paint which thickens it. Once I have mixed or selected the paint I am using and added it to the pallet, I include the gel. This thickens up the paint and gives the daubs applied more texture. I primarily work with acrylics now so a good brand to start with is Liquitex. Start out by deciding on those areas you want to add paint, take a small brush and have fun. Try to conform to the brush strokes of your digital painting as much as possible. You can also take some of the gel medium without any paint mixed in and with larger brushes apply brush stroke texture to areas. There are no rules other than what you set for yourself so apply as much or little as you feel comfortable with. In summary, painting over a canvas print can is easier than you might think and can be quite fun. The use of a digital paint program helps increase the appearance of a painted look to your image. Applying actual daubs of paint and a gel gives it even a more authentic and painterly look. Finally when all is said and done you have your own mixed media painting. Have fun!